A collection is a group of values or objects that are treated as a unit. The objects must be either of the same type or compatible. The values or objects should be easily added to the collection, located inside the collection, or removed from the collection. 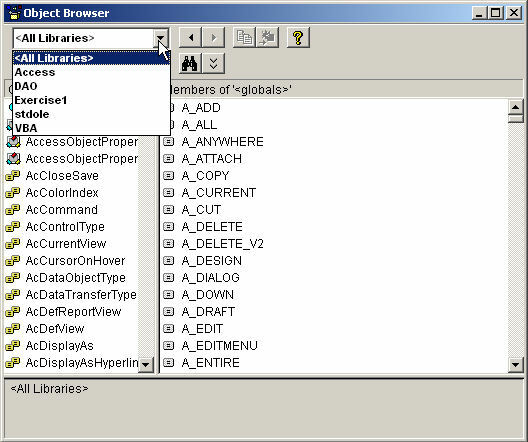 To support collections, the Visual Basic language provides a class named Collection. This method takes three argument but only the first is required, which is the value to add. You can call this method every time you need to add a value. In Controls section of the Ribbon, click the Button and click the form. In the VBA, you must first declare a variable that will represent each item of the collection. This variable will be used as the element. This is followed by the In keyword and the collection you will use. The statement ends with the Next keyword. In the statements section, specify the element. MsgBox "This collection contains " & months.Count & " items"
Every time you add a new item to the collection as we have done so far, the new item occupies a specific position. The position of an item within a collection is also referred to as the index of the item. You can locate an item based on its index. The first added item receives an index of 1, the second receives an index of 2, and so on. Based on this, to access an item, type the name of the collection followed by .Item(). In the parentheses, type the index of the item you want to access. By default, when you add a new item to a collection as we have done so far by passing only the required argument to the Collection.Add() method, the item receives a default index. When you add a new item to a collection, instead of letting the database engine specify a default index, you can provide an index of your choice. That index is referred to as a key. To specify the key of a new item, pass the second argument to the Collection.Add() method and give the desired value. The key should be a string and it must be unique among the other keys of the collection. To remove an item, pass its index as argument to this the method. 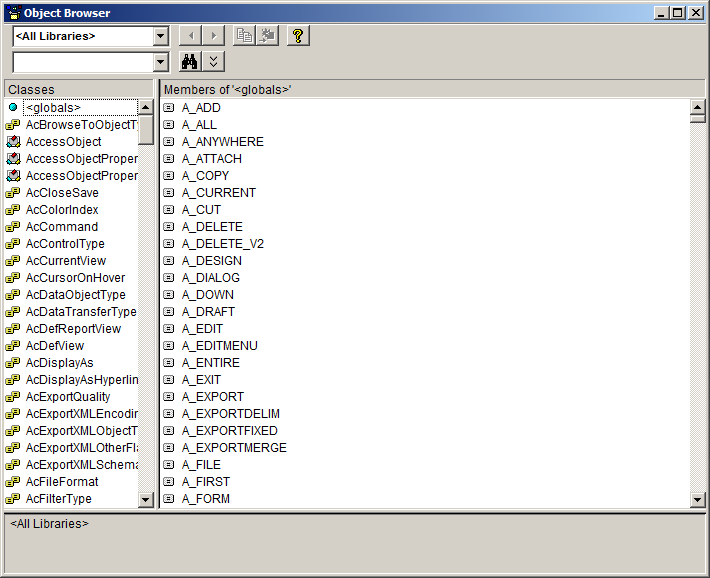 You can create a collection of objects, in which case the members are based on a class. You start the variable normally. One way to add an object is to first define it through a variable/object, then pass that object as the argument of the Collection.Add(). To access the items of a collection, you can use a For Each operation. Its element produces an item that you can use as you want. rd.Description = "From an interchange with I-71 west of Akron, Ohio, east to I-295 in Bellmawr, New Jersey." rd.Description = "From Cleveland, Ohio east to Atlantic City, New Jersey"
rd.Description = "From Kansas City, MO to Manitoba Highway 75 (in Canada)." rd.Description = "From East Bethesda to Pennsy Drive in Landover Hills"
The characteristics and actions we reviewed for a collection of regular values also apply to a list of objects. For example, to know the number of objects in a collection, you can just get the value of its Count. As mentioned previously, if you add objects to a collection by passing only one argument to the Collection.Add() method, each new object receives an incrementing 1-based index. You can use such an index to locate an object. You can use such a key to locate an object. From there, you can access the members of the class. A property of a class can be based on a collection. When accessing such a property, you actually get a collection, not a value. A property that holds a collection is called an indexed property. As mentioned already, when you access an indexed property, you get a collection of items. To access an item inside the collection, you can use the parentheses of the Item property. This would give you access to one of the items in the actual collection. 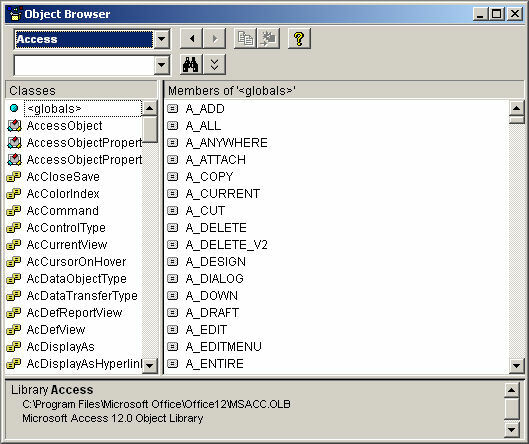 Microsoft Access heavily relies on built-in objects and already created collections. Besides the collections and objects, there are also many enumerations. There are so many objects, collections, classes, and enumerations that it is unrealistic to memorize all of them. While you are working in Microsoft Visual Basic, you can take a look at a list of available objects and enumerations. 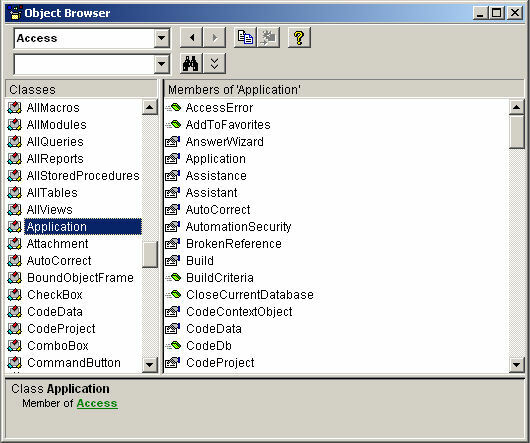 To get this list, you can use the Object Browser. If an item appears as a link (bold and green) in the bottom frame, you can click it. This would select it in the left column. 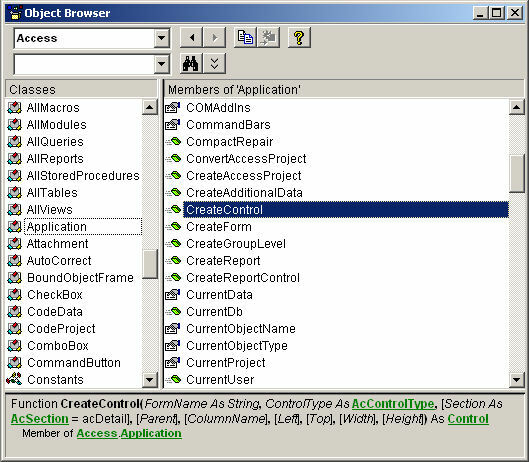 The CurrentData object holds the collections of objects that belong to the database.